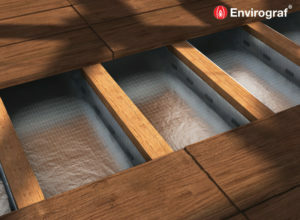 A 1mm thick reinforced glass cloth curtain impregnated with intumescent coating, designed to be affixed to a range of surfaces and structures. 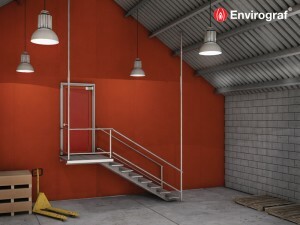 Provides fire protection, spread of flame, insulation, acoustic protection and smoke sealing. 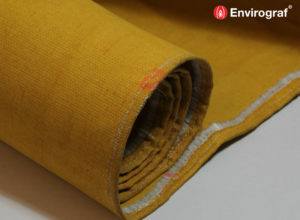 If additional insulation is required, please see our Insulated Fire Barrier Curtain (Product 54). adhesive to grip. 1 litre of Adhesive is sufficient for 50 metres of curtain. be applied over the glued joint to hold it more securely while the Adhesive dries. nails, screws, pop rivets (steel) or self tapping screws to the steel work. 1. 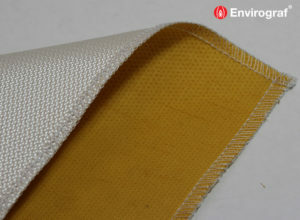 Wrap around the service with a section of the curtain and adhere together using the adhesive. adhere the cut area of the curtain to the wrapped service. For steel, timber or concrete or suspended ceilings fixing. Pre-drilled metal plates for ease of fixing. Where the curtain is in contact with T-bars, we can supply a U-clip which enables the curtain to be folded over the T-bar and U-clips pressed onto T-bars with pliers. White adhesive tape for joints and around services. Tested to BS476 Part 22 (1987), achieving 36 minutes integrity and 15 minutes insulation. 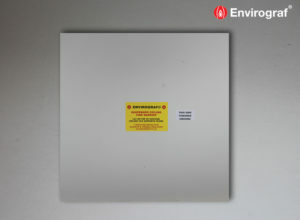 Tested to BS476 Part 22 (1987), achieving 22 minutes insulation over Class 0 suspended ceiling horizontally. Tested to BS476 Parts 6 & 7 (1987) achieving Class 0/1 spread of flame. Tested to BS476 Part 23 (1987) over light fittings, achieving 46 minutes integrity.